Recent news, analysis, and commentary about current conflicts, national defense, and special operations from around the world. Training Battlefield Airmen. The Air Force Battlefield Airmen Training Group is revamping how it trains prospective Air Force special operators. One way to avoid excessive attrition during training is to avoid injuries and to improve nutrition and sleep. Read more in “Tackling Battlefield Airmen Attrition Rates”, Air Force Magazine, October 5, 2018. 7th Special Operations & Irregular Warfare Symposium. A press release by the Defense Strategies Institute provides information on a SOF symposium taking place in Tampa, Florida on December 12-13, 2018. (PR.com, Oct 11, 2018). Photos – DEVGRU and 160th. 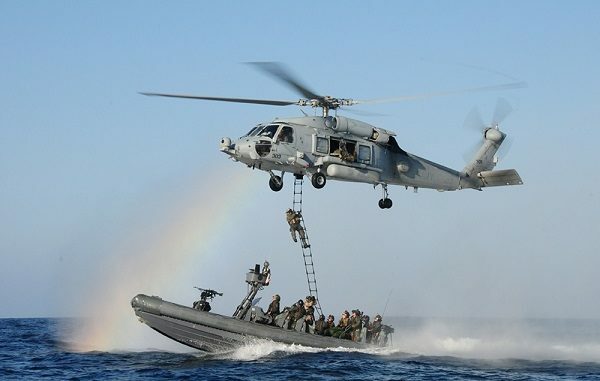 A photographer got lucky and scored some photos of a SOF exercise taking place off the coast of Virginia. (The Aviationist, Oct 11, 2018). SOF Planes for Canada – A Costly Purchase. The cost of three small surveillance aircraft for the Canadian military has increased significantly. (National Post, Oct 10, 2018). SOF in 1st Place for Best Warrior Competition. The annual competition for Soldier of the Year and Noncommissioned Officer of the Year resulted in USASOC taking first place in both categories in the Best Warrior Competition. A Civil Affairs Specialist assigned to the 1st Special Warfare Training Group at JFKSWCS at Fort Bragg was the NCO of the Year. A corporal with 3rd Battalion, 75th Ranger Regiment at Fort Benning was the Soldier of the Year. Watch videos of both below. USMC: Advisors and COIN – Not Going Away. Although DoD is pressing for big changes in military preparedness and strategy in anticipation of fighting ‘the big war’ with near-peer adversaries the US military will likely continue to fight in a counterinsurgency environment. The Marines have not lost their focus on it counterinsurgency mission. The Marine Corps Security Cooperation Group (MCSCG) will soon double in size and see a name change to Marine Advisor Group. Read “Counterinsurgency is here to stay: Marines plan to double foreign military training advisor group”, Marine Corps Times, October 10, 2018. Fat Soldiers and Recruits. The Army is having difficulty finding potential recruits that are not overweight, have a high school diploma, and do not have a criminal record. In addition, it has found that those in the ranks who are overweight have an increased rate of injuries. Read “America’s obesity is threatening national security, according to this study”, Army Times, October 10, 2018. ISIS in the Philippines. The Islamic State has announced the establishment of an East Asia Province in the Philippines. The number of ISIS-related attacks have increased over the past year as well as ‘media’ activity on the part of the terrorist group. Read “ISIS is Doubling Down on The Philippines”, INSITE Blog on Terrorism & Extremism, October 10, 2018. Afghanistan – A Permanent War? Ali Wyne, a policy analyst at RAND Corporation says that if Afghanistan is to be a permanent war then there are three questions the U.S. public might consider. “The Risks of Permanent War”, The RAND Blog, September 28, 2018. US Army Africa. The Army component of Africa Command has a new commander. MG Roger Cloutier has taken command (this past August). He has a lot on his plate. Read more on Army Africa’s campaign support plan for AFRICOM, where Army assets are deployed in Africa, and possible use of a regionally-focused SFAB for Africa. (Army Times, Oct 10, 2018). CT Strategy and the Takfiri. The fight against terrorism could easily be called the Long War. It isn’t going away and that is why the new National Strategy for Counterterrorism (NSC) is important. Read Clifford May’s (president of the Foundation for Defense of Democracies) article – “Trump’s new counterterrorism strategy”, The Washington Times, October 9, 2018. Paper – Where Is the Force Structure? The Trump administration has increased defense spending over the past two years by the billions (around $95 B) but the force structure has not increased significantly. This is due to other priorities such as readiness and modernization. Read more in 10-page paper by Mark Cancia – a senior advisor with the CSIS International Security Program Read Defense Buildup: Where are the Forces?, Center for Strategic and International Studies (CSIS), October 11, 2018. 2018 Noncommissioned Officer of the Year, Army.mil, October 9, 2018, 30 secs. CA specialist from JFKSWCS takes 1st place. 2018 Soldier of the Year, Army.mil, October 9, 2018, 30 secs. Corporal from 3/75th Ranger Regiment takes 1st place. Photo: Maritime training by west coast NSW unit. Photo by Lt. NSW Group One, October 21, 2010.